Established in the year 1997 at Faridabad (Haryana, India), we, “AR Industries”, are engaged in manufacturing and supplying of extensive range off Mobile Toilets and FRP Products. Our offered range of products comprises Mobile Toilet, FRP Boat and FRP Door. These products are manufactured in complete accordance with the set industry standards using supreme quality raw material and latest technology under the supervision of our skilled professionals. The raw material which we use to fabricate these products is procured from the most reliable vendors of the industry. These products are widely demanded all across the market due to their fine finish, attractive look and extended durability. Our offered range of products is tested on several quality parameters in order to deliver the defect free range of product at clients’ end. The entire product range is available in various specifications & can also be customized as per the requirements of clients. We have invested a big amount in our well-developed infrastructural base, which has contributed towards the tremendous growth and success of our organization. We have further categorized this unit into various sub-departments such as procurement, production, quality control, warehousing & packaging, sales & marketing, etc. The work in these departments is carried out by our very competent and highly qualified professionals, who ensure hassle free operation. Our manufacturing unit is supported by the latest machinery and the latest technology which enables us to undertake bulk orders of clients and supply them with the material within the committed time frame. All our team members work round the clock in order to accomplish the predetermined goals of the organization. Our team is the strength of our organization assisting us in scaling great heights of success in the industry. Under the proficient leadership of our mentor, “Mr. Shyam Singhal”, we have been able to meet the precise requirements of clients in the most efficient manner. His rich industry understanding and sharp business insight helps us to become renowned name in the industry. 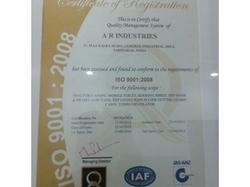 Since the establishment of our organization, quality standardization has always been our prime objective. The company makes use of all the available resources to the fullest in order to increase the production capacity. The work standards are the best in the industry, which are significantly represented by the quality parameters. With a view to meet requirements of the clients with the best-in-class range of Prefabricated Structures we precisely execute entire production process in accordance with the ISO 9001:2008 standards. In addition to this, we have employed a team of expert quality controllers, which checks and tests the entire range on various parameters to eliminate defects that may occur during transportation. Ansal Housing and Constructions Ltd.
We have appointed a team of hardworking, qualified and trained professionals, which uses all the available resources for providing customers with a qualitative range of FRP products. Furthermore, we are assisted by a team of managers and administrators, who make us to carry out business operations in the most promising manner. In this manner, our entire team make us to establish harmonious relationship with the clients. We are among the leading names of the industry that engages in offering a wide range of FRP products. Our products are widely appreciated by the customers due to their longer functional life, easy usage, excellent performance and low maintenance. Following are some reasons for which our customers give priority to us over competitors.